When I see white nursery pictures I have to tip my hat to the brave souls who created them. Who could help but admire those who are willing to step out and do the extra work that it will take to keep the beautiful white baby bedding and nursery furniture in pristine condition. A white baby nursery might feature touches of peach, taupe or blush pink without compromising the desired effect. 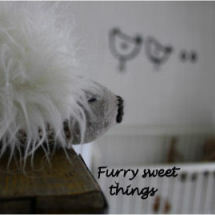 In a baby boy nursery, shades of gray are often included. In many all white nursery pictures shared by our visitors, the use of texture in the baby’s room eliminates the need for contrasting colors and patterns. With a fluffy white rug, textured fabric and wall hangings, the nursery's natural light sources causes shading that replaces a contrasting nursery color scheme. Shapes and details that when at first glance escape you start to register and to your surprise you realize that the all white nursery in the photo is not solid white at all. Perhaps the hardwood flooring or some other neutral hiding in plain sight that subtly makes the white nursery furniture pop to the foreground in visual perfection. Or is it an neutral shade of gray wall paint masquerading as white that gives the space a clean, modern appearance? 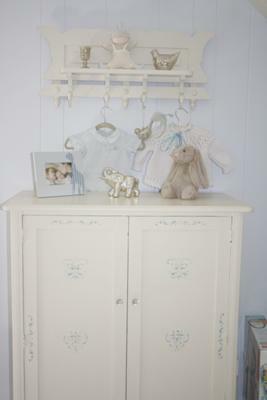 It's true that most nurseries decorated in white feature a unique contemporary style, antique white as well as vintage themes can be managed if the depth of color is kept to a minimum. Antique silver heirlooms and vintage decorations in shades of pale, baby blue blend while adding interest to a baby boy's white nursery. The white nursery pictures on this page are perfectly staged for the photo shoot. As we know, babies can be messy making whitea less than perfect choice for those of us (including myself) who tend to ignore the handprints on the walls and only let health hazards put them in high gear with a cleaning bucket. But when I look at white nursery pictures I can’t help but be envious and a little amazed at how very stylish (and clean) these rooms are with no color matching required. 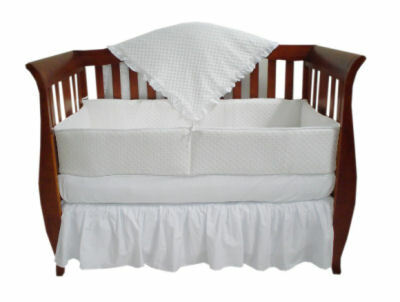 Return to Unique Baby Gear Ideas find more nursery decorating advice and pictures of beautifully decorated white on white baby nurseries and decor. 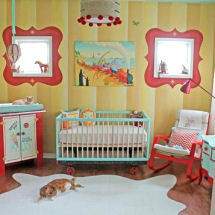 Please tell us about the bedding, decorations and furnishings that you used to create the ultimate baby's nursery. Be descriptive with brand names when possible to help visitors who want to flatter you by copying various aspects of your design. Give us some details on colors, bedding, decorations etc. Be sure to ask for email notification when our visitors leave compliments! We LOVE pictures so please locate yours on your computer and upload one.